Some Israeli special force units were created with the main task to raid prisons, the most known units with this task are (Nahshon, Massada, Dror, and Yamas). Each year those units conduct around 250 to 300 raids and sometimes more. According to what information Addameer’s lawyer received, on 20 January 2019 Israeli special force unit “Massada” raided section 17 at Ofer prison. 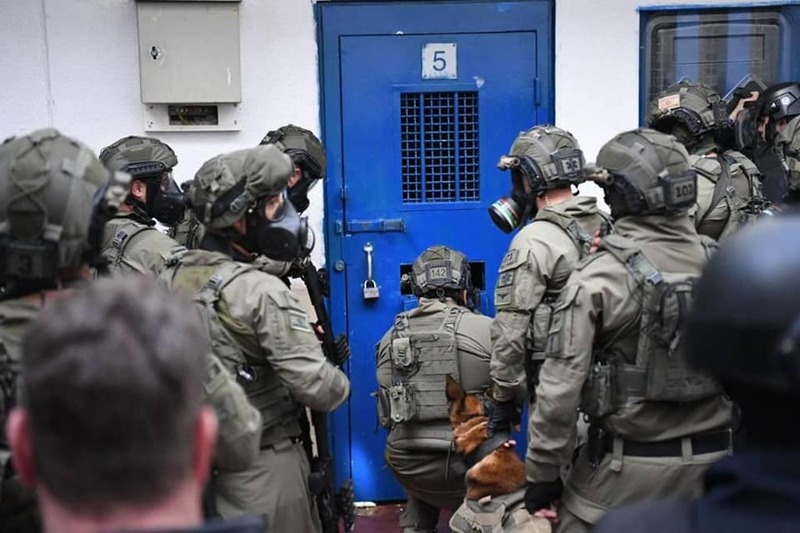 The same special unit “Massada” continued collectively punishing Palestinian prisoners on the following day, 21 January 2019 and raided other sections in the same manner. Each of these raids lasted for several hours. This special unit on 21 Jan 2019 raided section 15 and used excessive force through throwing tear gas bombs inside the closed rooms and also shooting what the prisoners assumed to be rubber bullets. The special unit came with a large number of Israeli soldiers with their dogs, they searched the rooms, damaged and confiscated some of its belongings. As a result of this raid, a fire occurred in three rooms of section 15, room 3, 5 and 8. Immediately after, the Israeli special force unit raided the rest of the prison’s sections and threw tear gas bombs inside all of them. The estimated number of injuries caused by these intense raids is around 100, until now, there is no clear information about the nature of these injuries or about the number of cases who were transferred to hospitals. Most of the court sessions at Ofer were canceled on Monday, 21 January 2019, and the prison was under a complete closure which prevented any communication with the outside world. Until this moment all of the prisoners at Ofer refuse to go out in their recreational time and are not accepting meals from the Israeli Prison Services (IPS). It is worth mentioning that Ofer has around 1000 Palestinian prisoners. The Massada unit was established in 2003 as a special unit for rapid response in emergencies. The unit consists of elite soldiers and officers from selected army units, who have gone through medical examinations and extensive training. The Massada unit is made of several squads and works around the clock.